We posted in October listing some of the services we were expecting to start using GOV.UK Verify between October 2014 and March 2015. This post provides an update on our plans. Later this month, people will start being able to access the redundancy payments service in beta using GOV.UK Verify. DWP is continuing to develop its change of address service, including using GOV.UK Verify to allow people to access the service. This is not likely to become a public-facing service in its own right; it will be part of a range of other digital services. DVLA is now expecting to connect its View Driving Licence service to the hub in January 2015 and we expect that people will be able to access the service through GOV.UK Verify from March 2015. Happy New Year. I do hope that this year won't be as difficult as it seems at the moment. Identity Assurance was always going to be the hardest nut to crack, especially as it appears to be thought that it can be implemented by a National Government design team, in isolation. This para illustrates the difficulty which, using the present design philosophy, has led to the UK GDS IDA team painting itself into a corner, and working directly against the way the Scots see IDA being implemented. "DWP is continuing to develop its change of address service, including using GOV.UK Verify to allow people to access the service. This is not likely to become a public-facing service in its own right; it will be part of a range of other digital services". But no, the National perspective is always seen as the center of the universe rather than a hierarchy imposing their view on a lower level of governance. Eventually, we will see the utility of devolving the IDA to the institution responsible for issuing an exeat (to a recognize other). That, in itself, will be the greatest act of co-creation and transformation. Its beauty is that it will enable the beginnings of building global social institutions; ones that can replace the anachronisms we have inherited from a National "client/server" generation. Cheers! We are, separately, working on pilot projects led by local authorities through our work with the Open Identity Exchange (oixuk.org) to explore how GOV.UK Verify might work for local services. We're not proposing to impose anything in the way you've described, but the published standards for GOV.UK Verify have been designed to be applicable to local services as well, and this is what the pilots are exploring. This includes looking at attribute exchange, which as you've pointed out is likely to be an important part of the picture. Thanks again for commenting and happy new year - we're looking forward to carrying on the conversation throughout 2015! I think you've said in a previous blog post that Local Government services aren't currently part of the immediate plan. We think we need to have at least a vision of how Identity Assurance done via one or multiple agencies is going to interface with Local Government systems and services. There are plenty of people trying to work out how to do "Digital Transformation" of Local Government services (something that has in fact been going on for some time of course). Who, what and where, for example, is the assured link between an identity and a case in the back office for council tax, benefits, education, rates, social care, planning etc going to be done? Perhaps we could have a discusson about this? Hello Philip, thanks for your comment. Yes, you're right, we're prioritising central government services at the moment. We need to put the right commercial, legal and operational arrangements in place to allow local services to re-use GOV.UK Verify. To understand how these arrangements need to work, and to understand how it might work for users if they are able to access local services through GOV.UK Verify, we're working on a number of research and pilot projects through the Open Identity Exchange (OIX). See oixuk.org for some of the published reports and other information about those projects. Whether you have to sign in using GOV.UK Verify depends on which of the services it is that you're trying to access, and whether you're a returning user or coming to to the service for the first time. What is the relationship between Gov.uk Verify and existing Government Gateway accounts? Hi Gill, thanks for your comment. GOV.UK Verify and Government Gateway are separate. 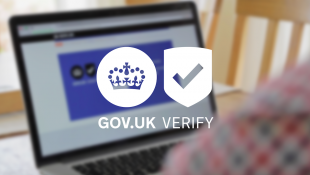 GOV.UK Verify allows people to verify their identity entirely digitally to a higher level of assurance, to access an increasing range of government services. Government Gateway fulfils a range of functions in addition to managing access to services through its enrolment and authentication services. GOV.UK Verify is not designed to replace all of Government Gateway's functions. Instead, it offers a service that provides identity proofing, verification and authentication services to enable individuals to access digital government services in a way that is faster and more secure. Will HMRC form R40 (Claim an over payment of tax) be included in iForms by 6th April 2015? Thanks for your comment and apologies for the slight delay in getting back to you. The R40 was out of scope for transition to an iForm and so won't be available in that format by 6th April. However, it remains in pdf format in GOV.UK to be read by an optical character reader.